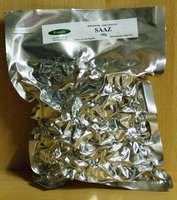 Brewers Gold hops - Vacuum packed for longer shelf life. Brewers Gold hops are a medium strength bittering hop that is used in English ales and heavier German style lagers. English Brewers Gold has a fairly neutral aroma charachter whilst German grown varieties have a spicy, fruity, blackcurrant flavour. Its typical alpha acid levels are 6.0-8.5% depending on the harvest, so you may need to adjust the amounts used in your recipe to ensure that you match the target EBU value.